Robb would have to reverse case law to ban Scabby, and First Amendment experts told Bloomberg that they didn’t believe a ban would survive a legal challenge. Courts have customarily found that Scabby is a noncoercive protest tactic. Robb might hate him, in other words, but balloons inflict no material harm. 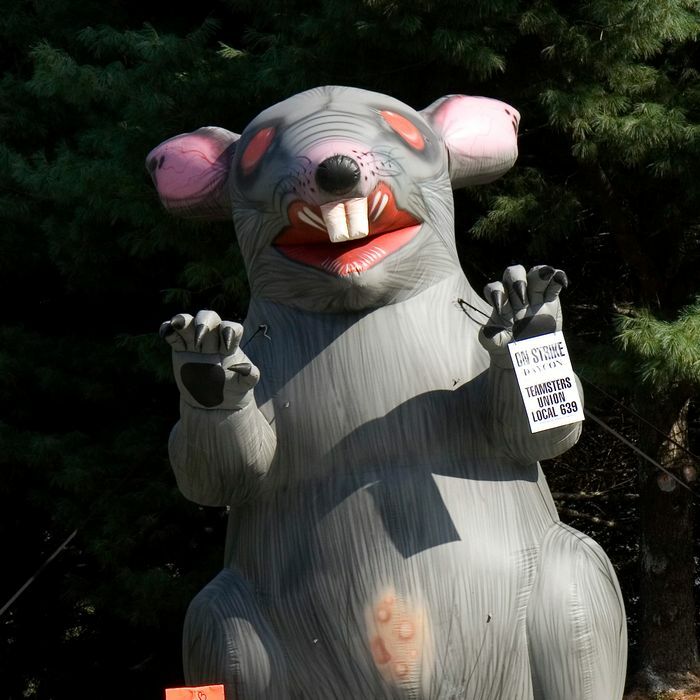 The rat is a symbol, an imaginative product of organized labor’s rank-and-file membership. A ban on Scabby would strike a significant psychological blow to labor. As Sarah Jaffe and Molly Crabapple reported for Vice News in 2013, Scabby is a relatively recent phenomenon. He originated in 1990, when Illinois-based members of the International Union of Bricklayers and Allied Craftworkers devised him to direct public attention to picket lines. Peggy and Mike O’Connor of Big Sky Balloons and Searchlights, Inc. produced the first Scabby. “Mike and the organizers were going back and forth, saying, ‘We need it more snarly.’ They wanted a mean, ghastly looking kind of rat,” Peggy told Jaffe and Crabapple. Scabby is indeed a gnarly sight, an apt visual depiction of the rat metaphor striking workers have historically applied to bad bosses. And he can be controversial, even within the labor movement. As Jaffe and Crabapple noted at the time, trade unions themselves once considered abandoning him. “Meeting with our Presidents and state councils. Issued a call to retire the inflatable rat. It does not reflect our new value proposition,” Sean McGarvey, president of the AFL-CIO’s Building and Construction Trades Department, once tweeted. Whatever that new value proposition happened to be, it failed. Though he is a new addition to the cultural history of organized labor, he quickly became popular with workers. So he lived on, in tweets and on picket lines and in the hearts of leftists everywhere. In an era marked by right-to-work laws and declining union membership, Scabby sparks joy. The rat owes his endurance partly to his efficacy as a nonviolent troll. “It’s one of those meddlesome things that all management lawyers really hate,” a management-side attorney for Seyfarth Shaw told Bloomberg Law. Which is entirely the point. If organized labor has one cool trick for making your boss squirm, it might just be Scabby. But unions don’t limit his use to formal strikes, nor is he meant solely as a means to shame union-busting bosses and scabs. He has broader significance. His ostentatious presence tells passers-by that there’s a fight nearby — that some injustice has occurred, or is occurring, and the workers standing next to him want to tell you about it, if you’ll listen. No wonder Robb hates him.